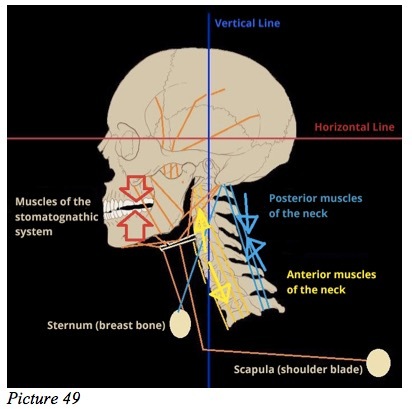 We have seen the close biomechanical relationships that are everywhere in the craniocervical mandibular sector. 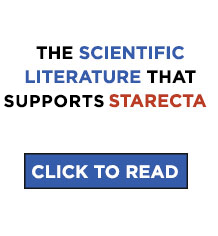 Now we can better understand the diverse compensatory measures that are generated during the collapse of the skull and what they entail for the structure of the muscles. We have seen previously that a lack of dental height in the premolar and molar area causes the skull to sink inexorably. The first muscles that begin to compensate, in this case to become shorter, are the masseter and the temporal muscles. As a result, also the supra- and infrahyoid muscles are put under strain, undergoing greater stress as a consequence. Under pressure from the stomatognathic system, the skull sinks, compromising the cervical area. 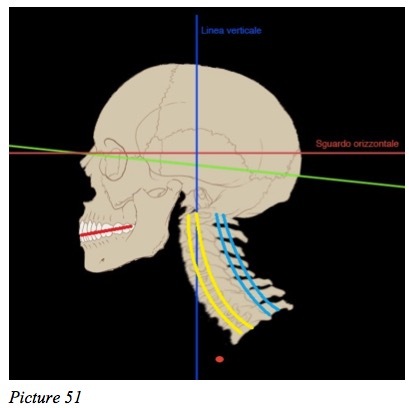 It is just at this moment that the muscles of the neck also change their form and their length, and are forced to compensate for the fall of the skull. To understand this better, look at picture 49. 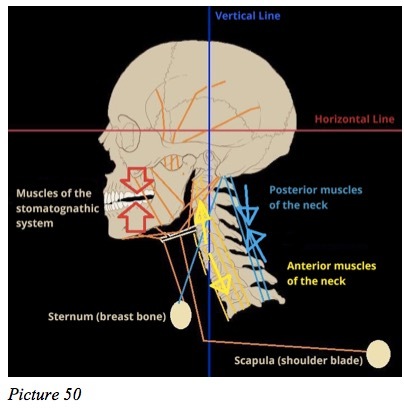 The posterior muscles of the neck, indicated in blue, are called upon to become shorter; conversely, the anterior neck muscles, indicated in yellow, are called upon to stretch themselves. During swallowing, muscular forces are transmitted from the stomatognathic apparatus, the muscles of the neck, the spine, and the body until finally reaching the feet, as can be seen in the picture. Such forces serve to recalibrate the musculature. 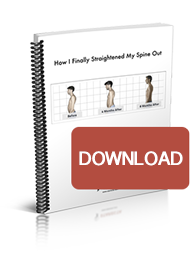 Pictures 50, 51, 52 and 53 were put side by side in order to highlight the changes and the musculoskeletal compensation caused by a lack of dental height. One notes that the skeleton to the right is compressed and forced to remain in a more restricted space to preserve, obviously, its dimensions. This translates into myriad intervertebral compressions. 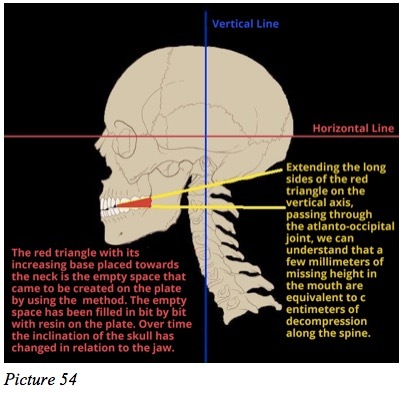 A misalignment of the head with the jaw, caused by a lack of dental height (craniomandibular, atlanto-occipital, etc.) is transferred, by means of the hyoid bone and the suprahyoid muscles, to the underlying structures that then have to adapt themselves to a change in tension, setting off a series of musculoskeletal compensatory measures, that have repercussions as far down as the feet.